Ovarian cancer is the major pelvic cancer health hazard for women. In 2000, the American Cancer Society estimates that 23,100 new ovarian cancer cases will be diagnosed and 14,000 women will have died of ovarian cancer (1). It is the fifth most common cancer in American women but the fourth most common cause of cancer death (1). The high mortality rate is due in part to a lack of obvious early warning symptoms, unavailability of sensitive early detection techniques and therapy of limited effectiveness. Despite improvements in management of women with epithelial ovarian cancer, the overall survival for this disease has been unchanged for at least the last 20 years (2). 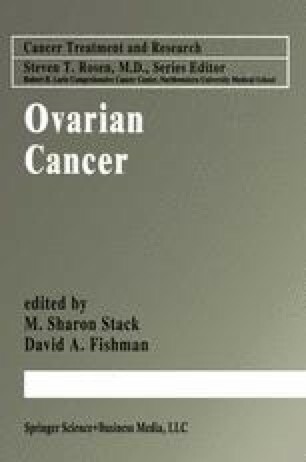 This chapter will concentrate on advances in the diagnosis and management of epithelial ovarian cancers, the form of ovarian cancer that represents at least 90% of all ovarian malignancies.